Skydiving Travel Insurance, we compare policies covering accidents, medical emergencies and repatriation, loss of earnings and personal accident. Skydiving can be undertaken at a wide variety of different levels, from a one-off tandem sky dive with an instructor to a sky diver who takes part in the sport as their main hobby. Whatever your level though, if you are planning a skydive, it's essential you are properly covered to participate - whether your insurance covers you fully is the last thing you want to be worried about when you are about to jump out of a plane. As with any insurance it’s important that you make sure you are properly covered for the type of trip you are undertaking, and that doesn't just apply to the skydiving - make sure all aspects of your break are covered! And read all the terms and conditions carefully (remember you have a cooling off period of 14 days with any insurance policy if you find you are not happy with the cover). Likewise, if you do not go sky diving on every holiday, a one off single trip policy may be a better option covering your skydiving trip separately rather than an all-encompassing annual policy. JS Travel Insurance are experts in finding excellent cover for specialist areas - and in particular they love adventure sports. We understand from the company that their skydiving policy is proving exceptionally popular. Select skydiving insurance from their list of sports and activities. They offer to quote over the phone on 0800 047 5065 or 01273 773 017 (Mon - Fri 9am - 5 pm). Sports travel insurance from the renowned specialist sports insurer SportsCover Direct provides single day or annual multi trip cover for holidays world-wide and can include cover for activities such as tandem sky diving (the company no longer cover solo skydivers). The company also offer 'ActivityTopUp' for one or multiple days cover abroad - which means their cover can be combined with another companies standard annual travel policy negating the need to duplicate insurance cover. SportsCover Direct offer a separate policy which offers Sports Accident Cover including Physiotherapy cover, Loss of Earnings, Personal Liability Protection, Legal expenses, Personal Accident Benefits and Rehabilitation cover. With Sports Accident insurance, they will cover solo skydiving within the UK as long as the participant is qualified to do so. Just select Sports Accident cover from the products list on their site. 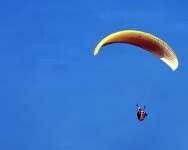 Tandem skydiving - this is undertaken with an experienced instructor who is fully trained. The instructor is in control of the whole jump from leaving the plane to ensuring the landing is as smooth as possible and will ensure the parachute is opened at the correct moment activating and controlling the parachute. Solo Skydiving - this is only undertaken by fully trained individuals who jump, normally in a group, from around 4000 metres before freefalling to a point where the parachute is activated to slow the fall and allow a safe landing. Skydiving accidents occur most frequently when the normal safety procedures are not followed as they should be, and the landing is the critical time when injuries tend to be leg or back related. Rigorous safety processes to check the equipment are undertaken, and a reserve 'chute is always carried. Unless a seasoned skydiver, equipment such as goggles, jumpsuit gloves and harnesses are provided by the company organising your jump. Europe is a popular venue for skydiving with centres both in the UK and notably in France, Spain, Portugal, Germany, the Czech Republic, Latvia and Greece (especially Crete). Worldwide destinations include the US, New Zealand and Australia - be aware that not all travel insurers will cover skydiving trips to the US due to the high cost of medical treatment, although both the companies on our panel will.